Enlarge / Everyone’s cabinets/cupboards basically look like this, right? It’s Thanksgiving in the US, and much of our staff is at work in a kitchen instead of an office space. As is becoming Ars tradition, we use such holiday times to provide a rare glimpse into life around the Orbital HQ: see prior peeks via desks, pets, chairs, or cars for example. Perhaps you can think of this as our way of bringing a classic green bean casserole to readers today. No matter whether an office exists as brick-and-mortar or Orbital, focuses on manufacturing, development, or journalist’ing, they all share one thing in common. It’s not too many sweets for holiday parties or too many devices still relying on Windows Server 2003. It’s that physical companion likely sitting directly to your side right now. The humble mug can carry everything from Soylent to the best cup of coffee science can engineer. It warms minds and bodies so folks everywhere—even those handling IT in the Arctic or working in literal ice labs—can tackle whatever the day has in store. Mugs do more than carry your preferred beverage, of course. They have backstories that can take you briefly to a different time and place; they leave subtle bits of a person’s personality out in the open for observant mug-watchers to notice. The mugs around Ars Technica’s Orbital HQ are no different (though this collection may soon sport more orange circles, wink-wink nudge-nudge). So in our latest glimpse at life on this side of your chosen Internet devices, we’ve zeroed in on perhaps the most important tool of any journalist’s day. See? The other side is just as cool. When you read about cable companies screwing over customers or the Federal Communications Commission stripping away consumer protections, you can thank this Beatles mug for carrying the fuel I need to power my brain through another day. I bought it for about $15 at the gift shop of the Beatles Love show in Las Vegas about seven years ago, and I’ve been drinking one or two cups of coffee out of it nearly every day since. The mug has survived many 30-second trips to the microwave because I like to keep the coffee hot. The art is a collage of Beatles album art that was used for the Anthology 2 and Anthology 3 compilation album covers. It isn’t as big as FCC Chairman Ajit Pai’s novelty oversized mug, but I find that it provides enough coffee to slog my way through the latest FCC filings. My coffee-making process is an epic, daily undertaking, and it requires no less than three ridiculous mugs. The first is a giant mug that I received as a gift from my mother with the phrase “I <3 Coffee” written in some god-awful descendant of the Papyrus font. I hate it (hence, not pictured). But I love my mom, so I use it pretty regularly. The second is a Luigi mug from the Nintendo Store in Rockefeller Plaza, and I’m a fan of that mug because I think it’s fun to wake up with second-best. But my favorite R2D2 mug, pictured above, comes from the bonkers Star Wars merch shop at Disneyland. It’s currently a theme-park exclusive, as are its Darth Vader and Boba Fett siblings, and they’re definitely better than the molded character-shaped mugs you’ll find at drugstores and other average novelty shops. If you want to track these down online, they’re usually marked up and sold by resellers. (Disney’s official online shop doesn’t sell them anymore.) This merch shop also has two build-your-own-toy stations: one for lightsabers, and one for tiny, LEGO-sized droids. I don’t know how I walked out of that shop with my wallet intact. 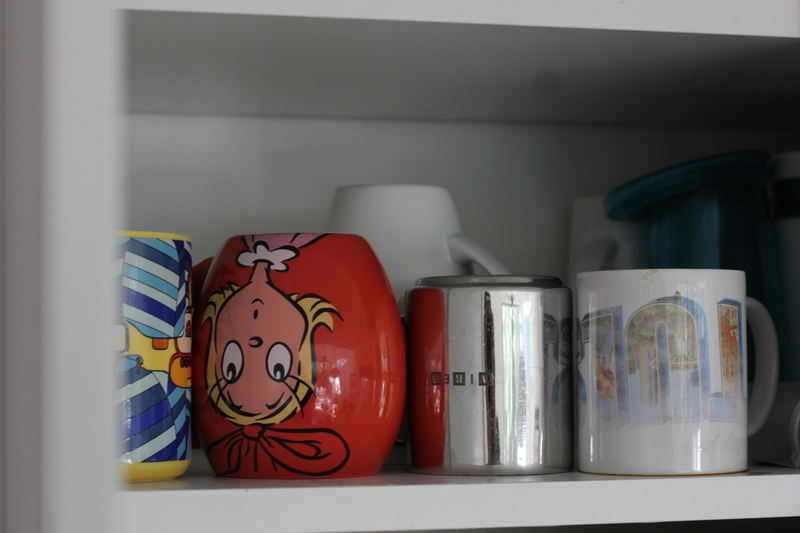 I have a true hodgepodge of mugs in my cupboard; it’s hard to find two of a kind. Some are from past lives in different cities, and one I vindictively stole from a bad roommate. I have your usual sci-fi candidates: a Star Trek Enterprise NCC-1701 blueprint mug, a Dalek “You Will All Be Exterminated” mug (for when you need a pep talk from your drink-ware on a take-no-prisoners kind of day). I also have mugs from places I’ve traveled (New Orleans’ Cafe Du Monde, Face Rock Creamery in Bandon, Oregon). Buying a mug, however, is not a travel tradition for me, so looking at my mugs is not a way to catalog my wandering. This mug from Death Valley is my favorite, though. It holds the perfect amount of coffee, and it’s the mug I reserve for “good days.” The kind of days when you wake up and the air is crisp without being cold; or when a good, kind e-mail from a person you respect has tumbled into your inbox over night; when you had that dream about an old friend that made you wake up laughing. I got this mug after a camping trip with my best friends in the lowest region in North America. I try to only use it at my highest points (so that I don’t wear off the design with excessive washing).